1. Both recipes were extremely easy. No waiting a day for pre-ferments, just mix up the ingredients, knead, shape, proof, bake and boom: you have yummy bread in about 4 hours. 2. They’re just good. Period. 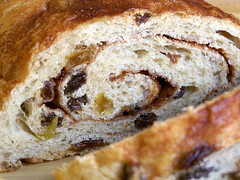 The raisin bread tasted just like the raisin bread you buy at the store. The cinnamon rolls were just amazing. I could have eaten about a million of them. In fact, after picking out the photos for this entry (it’s been a few weeks since I actually made them), I got such a craving for them that I had to make another batch. 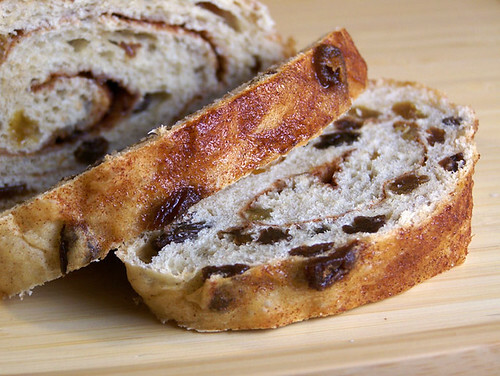 The cinnamon raisin bread was another story. First of all, it’s supposed to be raisin walnut bread. But I don’t like walnuts (or any kind of nuts), especially if they are baked into things, so I omitted that ingredient and added golden raisins along with the normal raisins. Secondly, Rinehart gives the option of making cinnamon-swirl raisin bread so of course I wanted to make that because it sounded more fun. Unfortunately, my first try was a disaster. Everything seemed good until I put the loaves in the oven and when I checked back a little while later, they had completely deflated. They were sad and lumpy and tasted kind of dry as well. At first I didn’t know what went wrong, but after some googling I figured out I had over-proofed them. When I tried the recipe again I figured out why: my loaf pans are about 1 inch larger (length and width-wise) than the size he says to use. I thought I had standard sized pans, but I guess not (that or he specifies smaller pans?). The problem came about when I had let the dough rise for more than an hour longer than I was supposed to because I was trying to get it to rise above the top of the pans (which it never really did). I didn’t realize that over-proofing could cause such problems, but I’ve more than learned my lesson on that one. My second try was much more successful. The loaves were still kind of flat because of the big pans, though. I’m going to buy some loaf pans in the size he says to use (8-1/2 x4-1/2) and hopefully then I’ll get the height I want. I made one plain loaf and one cinnamon-swirl loaf and the plain loaf rose a lot more, so that also seems to be a factor. But despite that, both loaves tasted great, not dry this time. Of course, I liked the cinnamon-swirl more than the plain, but how could you not? 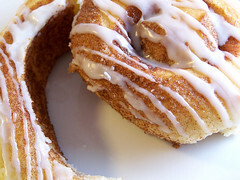 I slathered the tops with butter and sprinkled on cinnamon-sugar, which made them even better. 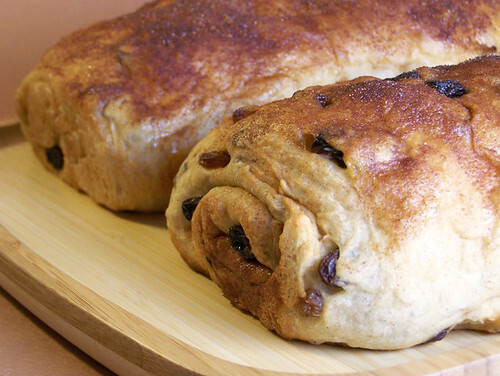 I usually buy raisin bread from the grocery store, but now that I see how easy it is to make, I’ll be baking it myself from now on. That reason alone is why I’m so glad I’m doing this challenge. A few months ago, I would never have described making raisin bread or cinnamon rolls as “easy” and it’s been really great discovering that bread baking is not nearly as complicated or intimidating as I thought. These were two of my favs. You did an excellent job. So yummy looking. .-= Susie´s last blog ..Bread Baker’s Apprentice: CHALLENGE #15 Italian Bread =-. Oh they both looks so fabulous! I have overproofed bread before and it’s not pretty, I agree, but THESE are definitely pretty! I’m new to BBA, have only done the first two, can’t wait to get to these! I absolutely have to try this recipe. Those are the most lovely cinnamon rolls I’ve ever seen! They look like they’re straight from the bakery shelf. .-= Erin´s last blog ..Summer Vegetable Gratin =-. 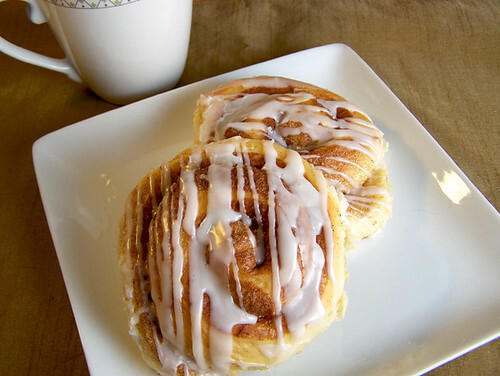 i rarely see such tender and professional-looking cinnamon rolls, and to think that you consider them easy to produce makes me want to curtsy at your feet. bravo! .-= grace´s last blog ..these ain’t yo mamsta’s biscuits… =-. Thanks for the nice comments everyone!! 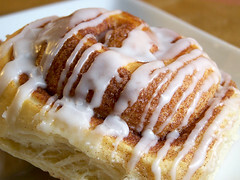 Those cinnamon rolls are the best I’ve ever had, I definitely recommend them. Even if you haven’t done much baking they are quite easy. .-= Bert´s last blog ..Ratenkredit Rechner =-. What a great yummy blog my wife loves this. .-= Richard Johnson´s last blog ..Enclume PR16CWG HS Premier 4-Foot Oval Ceiling Pot Rack, Hammered Steel =-.